'Star Of India' (Thomas Johnson, R. 2011). Seedling# TZ336A, SDB , 12" (30 cm) , Midseason bloom. Standards clear medium blue covered with fine network of darker blue texture veins; falls same, short blue-white rays flanking beard; beards tangerine, white at end; slight fragrance. 'Microwave' X ' Little Sweden'. Mid-America 2011. From Mid-America Garden catalog, 2011: OF INDIA (T.Johnson ‘11) SDB Midseason 12” (30cm). Star of India, the iris, is the embodiment of the clear blue color of the world's largest star sapphire. 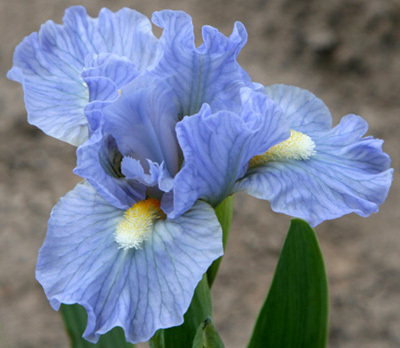 Standards and falls of clear mid blue are covered with a fine network of darker blue texture veins. Blue white rays flanking tangerine to white beards are the star of this lovely creation. Sdlg. TZ336A: Microwave X Little Sweden. $18.00.